Also serving communities of Farmerville. To help you with your search, browse the 1 review below for assisted living facilities in Ruston. On average, consumers rate assisted living in Ruston 5.0 out of 5 stars. Caring.com has helped thousands of families find high-quality senior care. To speak with one of our Family Advisors about assisted living options and costs in Ruston, call (855) 863-8283. Seniors in Ruston, Lousiana make up 10 percent of the population and those who are in need of a little help with medication management and the activities of daily living, including dressing, bathing and grooming, can choose from two assisted living facilities in Ruston. The Health Standards Section of Louisiana's Department of Health licenses all assisted living facilities in the state, ensuring seniors are treated respect and dignity while getting the care they need. The cost of living in Ruston is 8.9 percent below the national average, making it a good location for seniors who want to stretch their retirement income. Ruston has an array of community resources for seniors, including the Lincoln Council on Aging, an organization that provides computer classes, legal services for seniors and transportation, as well as one senior center. The historic Dixie Theater in Ruston presents community theater, independent film, dance recitals and concerts, and local seniors can also take advantage of entertainment and arts opportunities at Louisiana Tech University, often with senior discounts available. Musicians from the region converge upon Ruston annually for the John Simoneaux Memorial Jam. Minimal public transportation is available in the rural areas surrounding Ruston, with the Lincoln Parish Public Transportation System providing the only service, so seniors who don't drive might find it hard to get around. Greyhound bus service is available between Ruston and Shreveport. Summertime weather in Ruston is hot and humid, with high temperatures in the upper 80s and low 90s. Winters are short and rarely fall below freezing, with high temperatures hovering in the mid 60s. Locals can expect cloudy weather through much of the year. The Ruston area is home to world-class medical facilities, including the Ruston Regional Specialty Hospital, in the event of medical emergencies or illness. Assisted Living costs in Ruston start around $0 per month on average, while the nationwide average cost of assisted living is $4,000 per month, according to the latest figures from Genworth’s Cost of Care Survey. It’s important to note that assisted living rates in Ruston and the surrounding suburbs can vary widely based on factors such as location, the level of care needed, apartment size and the types of amenities offered at each community. 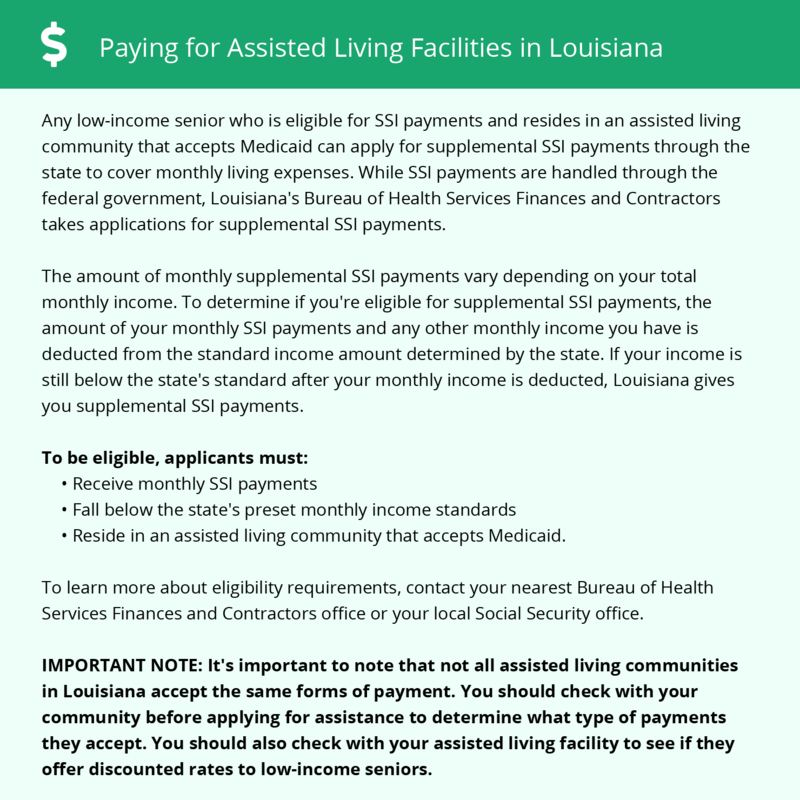 Eligible low-income seniors who need financial help to pay for their assisted living facility fees may apply to the Louisiana Permanent Supportive Housing program. This program offers affordable housing in various locations across the state, including several residences designated for the elderly. Some locations also provide transportation, medication management and other support. Ruston and the surrounding area are home to numerous government agencies and non-profit organizations offering help for seniors searching for or currently residing in an assisted living community. These organizations can also provide assistance in a number of other eldercare services such as geriatric care management, elder law advice, estate planning, finding home care and health and wellness programs. To see a list of free assisted living resources in Ruston, please visit our Assisted Living in Louisiana page. Ruston-area assisted living communities must adhere to the comprehensive set of state laws and regulations that all assisted living communities in Louisiana are required to follow. Visit our Assisted Living in Louisiana page for more information about these laws.